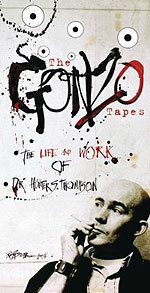 CD review: "The Gonzo Tapes: The Life and Work of Dr. Hunter S. Thompson"
It's hard to know how much of an audience there might be for the tape-recorded stream-of-consciousness observations of late author and journalist Hunter S. Thompson, but Shout! Factory obviously thinks there is some demographic worthy of targeting, what with a five-CD set. Taking in his most productive years of 1965 to 1975, the recordings here alternate between Thompson's obsessive muttering of a play-by-play narrative of his own life in real time and a sort of environmental recording, where the tape deck is running in the background as Thompson goes about his day. Those who've read his books will find Thompson's observations on his various works in progress illuminating; his take on Sonny Barger, leader of the Hells Angels when Thompson was writing his breakthrough book on the biker gang, is far more brutally honest than what got into the book. More casual fans are likely to be either bored silly or overwhelmed by these recordings. But for hard-core fans, it's a bit like getting to hang out with the man  hearing him discuss what he's writing at the time, over breakfast or while driving, or trying to coax the right words out of his typewriter. And the two discs of recordings made while he was writing "Fear and Loathing in Las Vegas" are more interesting and revealing than either the Bill Murray or Johnny Depp films.